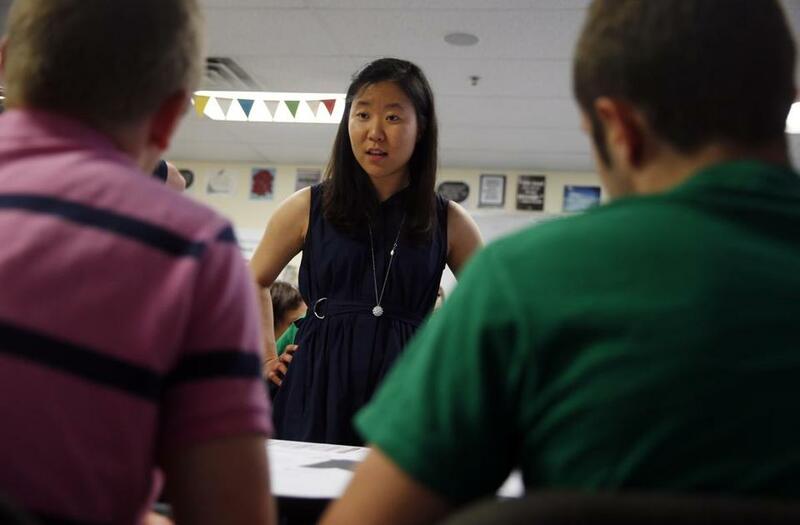 Lawyer Judith Kim explained Miranda rights to students at William J. Ostiguy High School in Boston. 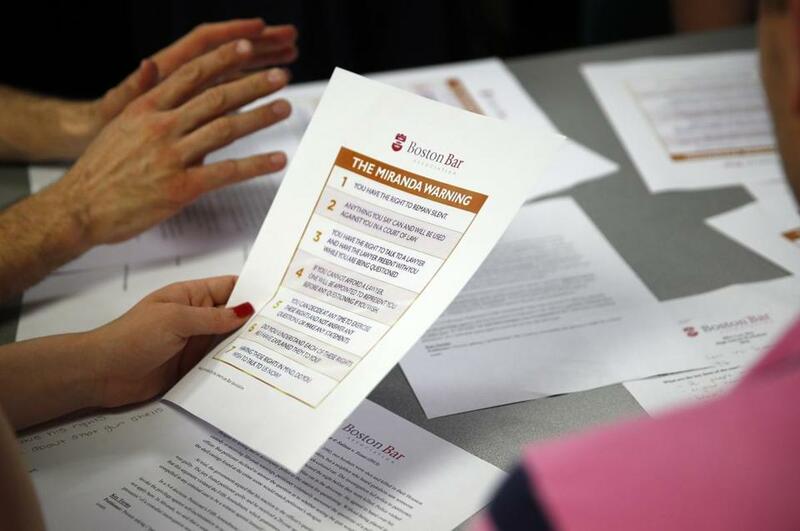 The Boston Bar Association aims to teach more than 1,500 students about the subject. The deaths of several black men and women around the country at the hands of police have not only revived old tensions between the authorities and community members. The tragedies have also raised concerns that young people need more awareness of their legal rights. With this in mind, the Boston Bar Association recently set out to teach more than 1,500 students at 13 public schools across the city about their rights and police procedures. It is particularly relevant right now that young people know they can refuse to be interrogated and can demand a lawyer, said Carol Starkey, the bar’s president-elect. Starkey, who worked for 13 years as a prosecutor, said she did not fully understand how little trust some communities have for police until she became a defense attorney 14 years ago. The association’s education efforts — from Boston’s kindergarten classes through the high schools — are intended to improve relationships between police and the community, she said, and to overcome the distrust that can exist on both sides. The recent lesson is part of the association’s Law Day in the Schools Program, which this year celebrates its 30th anniversary. It is a banner year, too, for the legal protections against self-incrimination commonly called Miranda rights. The US Supreme Court ruled that Americans are guaranteed those protections 50 years ago in the landmark Miranda v. Arizona case. 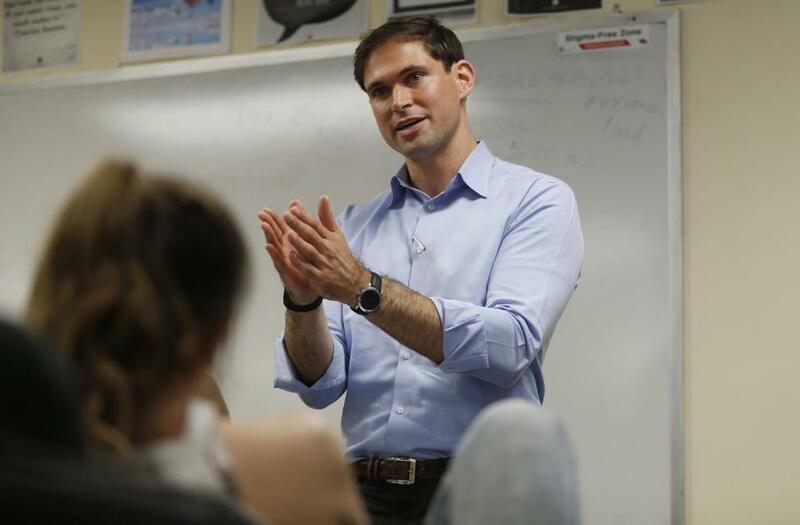 On a recent morning at William J. Ostiguy High School in downtown Boston, students listened intently and asked pointed questions of visiting attorneys at the front of the crowded classroom. Students at Ostiguy High reviewed a summary of Miranda rights, the first of which is the right to remain silent. Though many young people might envision such a scenario, it may have hit closer to home for teenagers at Ostiguy High, where students are working to overcome addiction. Some have been arrested on drug-related crimes or had other interactions with police. Children of all ages have seen film and television depictions of the Miranda warnings that police recite in an arrest — some of them accurate and others distorted, Starkey said. Ostiguy student Sage, 18, whom the Globe is identifying only by first name because she is in recovery, said she learned a person being questioned by police should ask if they are free to go, and that police are not required to read the Miranda warning if the person is not in custody. “It’s all about what you’re legally allowed to do, and what they’re legally allowed — and not allowed — to do, which was interesting,” she said. Megan, also 18, said she already knew some of her rights, but she learned that, when invoking the Fifth Amendment protection against self-incrimination, it is safer to say out loud that you do not want to speak rather than just refusing to respond to questions. She said the lesson gave her more confidence in asserting her rights, if the need arises. Megan said she has not had any encounters with police, but she lives in a youth recovery home where some girls have been arrested and assigned to live there by the courts. “I’ve been really lucky, actually, because I’ve obviously been driving around with drugs in the car,” she said. The frame of reference can be very different for younger students, but the rights are just as relevant, Starkey said. This spring, she presented a Miranda lesson to a second-grade class at Mozart Elementary School in Roslindale. Starkey said the students gave her a fresh perspective on the importance of the rights and left her feeling energized and optimistic. Attorney Nate Koslof spoke to the students.